Macular hole surgery has evolved into an efficacious surgical technique since its description by Kelly and Wendell in 1991.1 Success rates of greater than 90% are possible using just internal limiting membrane (ILM) peeling techniques in most eyes with small and recent macular holes. 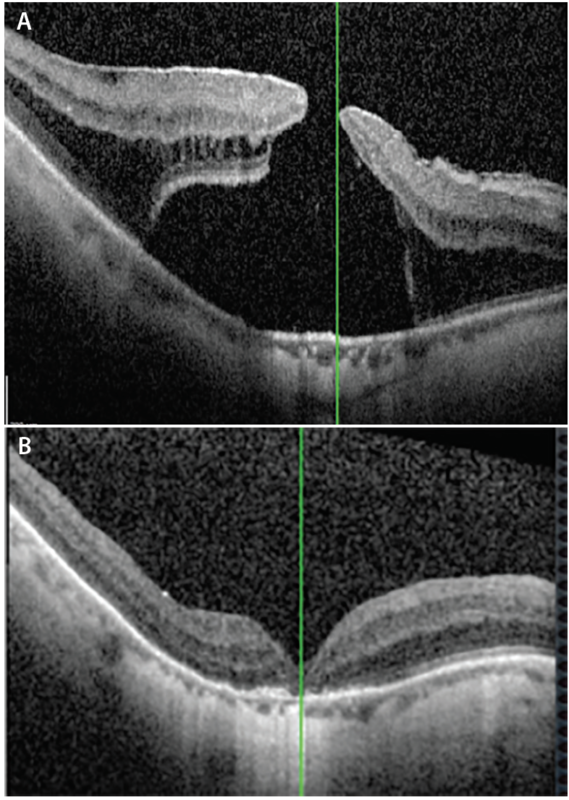 Nevertheless, larger holes, older holes, and those occurring secondary to high myopia or retinal detachment are associated with lower closure rates and reduced visual outcomes. These macular hole pathologies pose a challenge, and a number of techniques have been devised to improve anatomic and visual outcomes in these eyes. • Unsatisfactory visual and anatomic outcomes are sometimes seen after surgery for large macular holes. • Use of autologous blood during macular hole surgeries that employ internal limiting membrane flaps may be a promising technique. 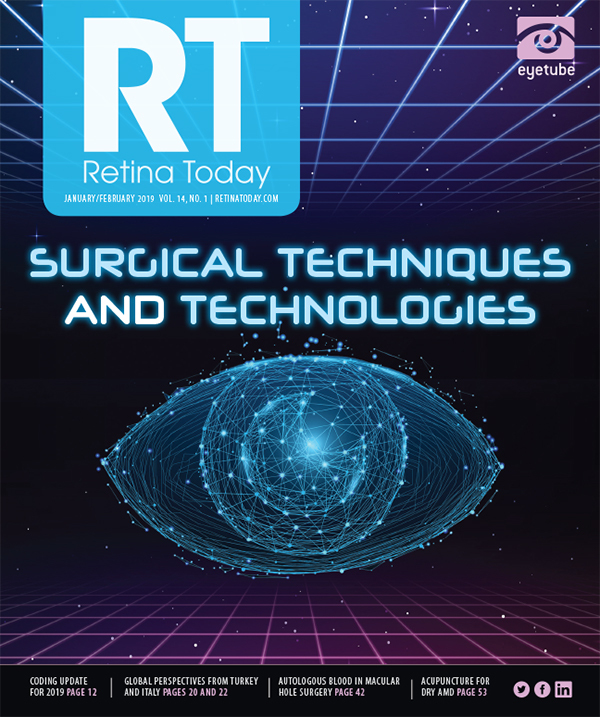 • A number of questions remain about the benefit of techniques that use autologous blood during macular hole surgeries, but good visual outcomes have been reported. Michalewska et al described the inverted flap technique in 2010 as an alternative to traditional ILM peeling in eyes with large macular holes or failed macular holes that have ILM present.2 Since that initial description, a number of variations of the technique have been published. These include temporal flaps, circumferential flaps, stuffing of the flap inside the macular hole, free flaps, and lens capsular flap transplantation.3-6 All of these techniques have anatomic closure rates of greater than 90%, even in eyes with large and failed macular holes. However, visual outcomes with these techniques have been less than optimal, and each technique poses unique challenges. OCT studies have identified better visual outcomes in cases that lack hyperreflectivity in the postoperative period and in cases in which ellipsoid layer and outer retinal layer alterations are smaller after surgery.7 Pathophysiologically, larger and older macular holes tend to have elevated edges, leading to a larger inner hole and thus a larger scotoma. Bringing the edges in apposition with the retinal pigment epithelium (RPE) would reduce the size of the central scotoma. The inverted flap lying over the surface of the retina in the area of the hole may act as scaffold on which fibroblasts can grow and help bring the edges of the hole closer together, thereby reducing the size of the scotoma. Meanwhile, stuffing the hole or placing ILM or lens capsule inside the hole may create a larger scotoma and could prevent approximation of the macular hole edge with the RPE, resulting in a suboptimal visual outcome despite anatomic closure. Maintaining the flap in place is one of the challenges of inverted flap and free-flap techniques. For inverted flaps, leaving the flap attached temporally allows air to secure it as fluid-air exchange is performed because the gas moves from the temporal side first. Still, dislodgement of the flap occurs in a number of cases. Maintaining attachment of free flaps in the foveal region is more challenging. Packing them inside a macular hole may prevent dislodging, but the ensuing scotoma can be larger. Securing free flaps under perfluorocarbon liquid and performing a direct oil exchange has been done, but this approach requires a second procedure for oil removal. 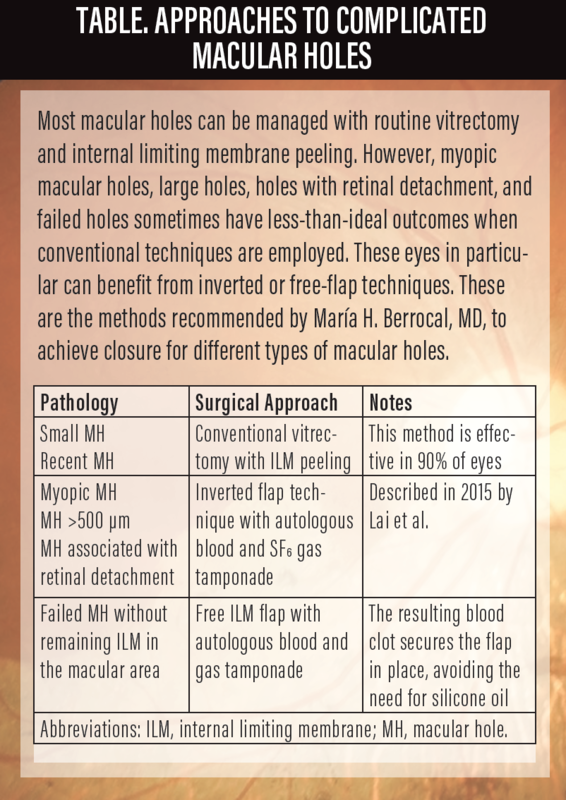 Lai et al described the technique of using an inverted flap with an autologous blood plug to secure the flap in place.9 This technique is promising, and it may warrant consideration when choosing one’s surgical approach to a macular hole (Table). (The technique can also be used with free flaps.) The blood clot that forms holds the flap in place while healing occurs. This approach can be performed without air or gas tamponade, which makes it particularly useful for patients who need to travel by plane or who cannot maintain a prone position. The potential benefits of blood products in the macular hole area merit further investigation. A complete vitrectomy is performed on a 25- or 27-gauge platform. The posterior hyaloid is detached and peeled with the vitrector, with or without triamcinolone staining. The ILM is stained with indocyanine green or brilliant blue dye. The ILM can then be peeled with the Finesse Flex Loop (Alcon), with forceps, or with the vitrectomy probe. An edge is started and is then engaged with the vitrectomy probe and peeled circumferentially, leaving a segment temporally attached to the edges of the hole. This segment is peeled toward the hole, leaving a hinge attached and inverting it over the macular hole. The vitrector is used to trim the flap so that it covers only the hole. Figure. OCT of localized retinal detachment associated with macular hole in a 60-year-old woman with -10 D. VA was counting fingers (A). OCT 6 months after vitrectomy with inverted flap and autologous blood technique. Macular hole closed and VA improved to 20/200 (B). Fluid-air exchange is performed with fluid aspiration by the vitrectomy probe over the optic nerve. Blood is drawn from the patient, and 1 or 2 drops are injected over the macular hole. The air in the vitreous cavity is replaced with 20% SF6 gas, and the patient is instructed to maintain prone positioning for 2 days. Excellent anatomic closure rates are seen with this technique as well as visual improvements, although the visual outcomes depend on the size of the hole, atrophy (in myopic patients), duration of retinal detachment (in holes associated with myopic detachments), and RPE status (Figure). The technique is promising because using the blood clot as a plug to secure the flap in place avoids the need for gas tamponade. Potential additional benefits of blood products also warrant further investigation. Outcomes using the inverted or free flap techniques with autologous blood only with air tamponade or with fluid also deserve study, as the technique may avoid the burdens of gas tamponade and positioning. 1. Kelly NE, Wendel RT. Vitreous surgery for idiopathic macular holes: results of a pilot study. Arch Ophthalmol. 1991;109(5):654-659. 2. Michalewska Z, Michalewski J, Adelman RA, Nawrocki J. Inverted internal limiting membrane flap technique for large macular holes. Ophthalmology. 2010;117(10):2018-2025. 3. Michalewska Z, Michalewski J, Dulczewska-Cichecka K, et al. Temporal inverted internal limiting membrane flap technique versus classic inverted internal limiting membrane flap technique: a comparative study. Retina. 2015;35(9):1844-1850. 4. Grewal DS, Mahmoud TH. Autologous neurosensory retinal free flap for closure of refractory myopic macular holes. JAMA Ophthalmol. 2016;134(2):229-230. 5. Morizane Y, Shiraga F, Kimura S, et al. Autologous transplantation of the internal limiting membrane for refractory macular holes. Am J Ophthalmol. 2014;157:861-869. 6. Chen SN, Yang CM. Lens capsular flap transplantation in the management of refractory macular hole from multiple etiologies. Retina. 2016;36(1):163-170. 7. Bottoni F, De Angelis S, Luccarelli S, et al. The dynamic healing process of idiopathic macular holes after surgical repair: a spectral-domain optical coherence tomography study. Invest Ophthalmol Vis Sci. 2011;52(7):4439-4446. 8. Chakrabarti M, Benjamin P, Chakrabarti K, Chakrabarti A. Closing macular holes with “macular plug” without gas tamponade and postoperative posturing. Retina. 2017;37(3):451-459. 9. Lai CC, Chen YP, Wang NK, et al. Vitrectomy with internal limiting membrane repositioning and autologous blood for macular hole retinal detachment in highly myopic eyes. Ophthalmology. 2015;122(9):1889-1898.